And July arrived and with it certain trips that each one will have selected with great care. For me, with great enthusiasm, I am pleased to talk about the treasure that houses the Cantabrian Mountains in our beloved Spain. 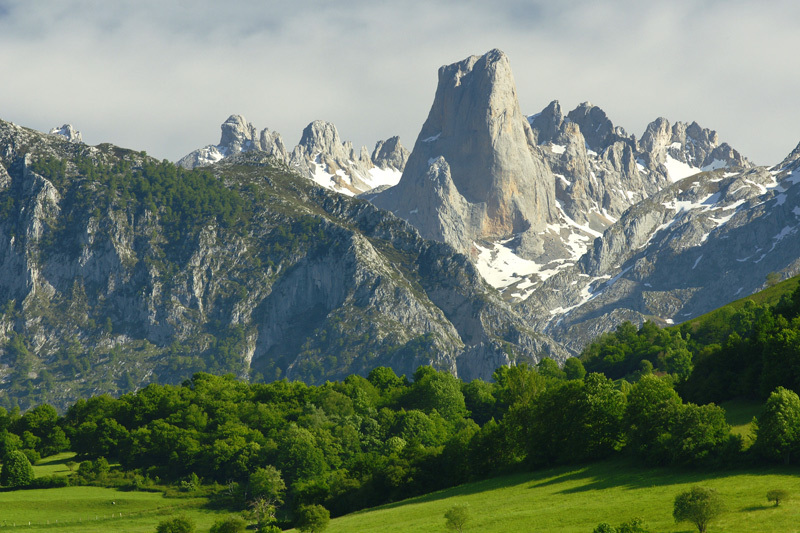 I suppose you will know that Picos de Europa constitutes a tremendous calcareous mass where the glaciers of the Quaternary taught their ice with great power. Currently the story has changed and climbers and passionate walkers are those who can enjoy their paradise from endless places. Its floral variety, depending on the height, houses species such as carrascales, arbutus, arboreal, cherry or ash. As we ascend, brown, holly, yew or cork oak trees appear and between 1,000 m and 2,000 m we offer oaks, birches and rebollares. The albar and the birch being the dominant species. But what about its varied fauna? I can highlight some birds such as heather, kingfish and redstart blight; Also amphibians and reptiles like salamander, alpine newt and red frog. With the height timidly appear robins, chamois, deer, wolves and wildcats. Each time we see more wolves and not surprising at all when it has been one of the most widespread mammals along the earth. But the jewel of these mountains is the brown bear, formerly occupied practically all of Europe and Asia, much of the western half of North America and some parts of the Middle East and Magred. In Spain we only have “teddy bears” in the Cantabrian Mountains and an area of Pyrenees. The males can weigh between 200-250kg, quite far from the Alaskan giants with specimens up to 700kg, wow !! My question is: is it not magical to feel the human silence that allows us to perceive and listen to the music of nature? It does not matter where we are, the fatigue of walking or how its history looks at us. I love experiencing the feeling of how the soul whispers an episode never told. Bueno, Pirineos también es un tesoro!! La cuestión es vernos en algún rincón lleno de encanto!!! tienes toda la razón, son increibles! Lo lindo es que hay mucha gente como vosotros que admira los tesoros de la naturaleza. Cada sitio tiene su magia!!! Hace años, desde que estuvo mi hija he pensado en ir a los Picos de Europa.Quizá este año sea el definitivo.Gracias por recordarmelo. ¡Picos es un lugar maravilloso! Hay muchas alternativas. Que maravilla encontrar sombre según subes a los Picos, pues me apetece para un viaje en verano.